On June 3, 2009, the Federal Circuit affirmed the U.S. District Court for the Southern District of Iowa’s denial of a preliminary injunction in a design patent infringement case, Titan Tire Corp. v. Case New Holland Inc., 90 USPQ2d 1918 (Fed. Cir. 2009). 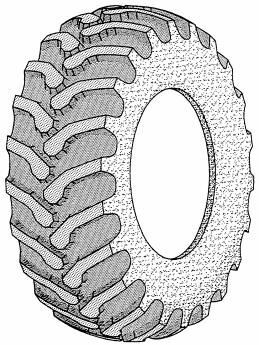 The patent at issue claims a tractor tire design (depicted below). Titan Tire Corp. (“Titan”) sued Case New Holland Inc. (“CNH”) for design patent infringement, alleging that CNH sold backhoes equipped with infringing tires. Three months later, Titan moved for a preliminary injunction. In denying the motion, the trial court found that Titan was likely to succeed in showing infringement and in withstanding a challenge to the design patent based on functionality grounds, but that the design patent likely would not survive a challenge to its validity on obviousness grounds. To obtain a preliminary injunction, a plaintiff must show: (1) a likelihood of success on the merits of the case; (2) a likelihood of irreparable harm in the absence of preliminary relief; (3) that the balance of equities that tips in its favor; and (4) that an injunction is in the public interest. To satisfy the first factor, a likelihood of success on the merits, a patent infringement plaintiff must show that it likely will prove infringement and that it likely will withstand any challenges to a pleaded patent’s validity. Thus, if a defendant challenges a patent’s validity at the preliminary injunction stage, the plaintiff has the burden of persuading the court that defendant’s arguments lack substantial merit. Like other types of patents, design patents are subject to the nonobviousness requirement of 35 U.S.C. § 103. A claimed design is obvious if a designer of ordinary skill in the art would have combined teachings of the prior art to create something with the same overall visual appearance. The combined teachings must include a primary reference featuring basically the same characteristics as the claimed design, as well as one or more secondary references used to modify the primary reference to create the claimed design. Here, the trial court found that three different prior art references “create basically the same visual impression” as the design in the pleaded patent, that is, “a tire tread with lugs that have two bent rib portions and an enlarged head that extends over the centerline of the tire.” Another, secondary reference depicted enlarged, six-sided lug heads. Although the trial court did not explicitly distinguish these references as “primary” or “secondary,” the Federal Circuit found the analysis sufficient to affirm the trial court’s decision. Teresa Tambolas is an attorney with Pattishall, McAuliffe, Newbury, Hilliard & Geraldson LLP, an intellectual property law firm with a global litigation, counseling and transactional practice, located in Chicago, Illinois. Pattishall has been recognized for many years as a preeminent trial and appellate firm in trademark and copyright law. Pattishall counsels clients in a broad range of intellectual property fields – including trademark, copyright, trade secret, advertising, design patent protection, and right of publicity law. Pattishall provides representation in litigation; strategic planning for brand protection; counseling on internet business development; due diligence research into the sale or acquisition of trademarks, copyrights, design patents and trade secrets; and design and implementation of international trademark acquisition and brand development strategies. Ms. Tambolas’s practice focuses on domestic and international design, trademark, trade dress and copyright law.